One of the best gifts that you can give a child is a good set of watercolors, brush and watercolor paper. They will take to it naturally. 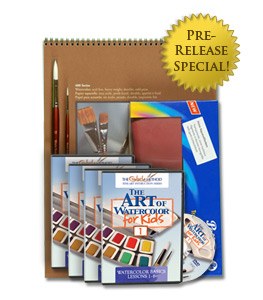 Now take that gift up a large notch - give a complete children's watercolor course via this 4 DVD set w/all materials included! The Art of Watercolor for Kids Complete Package is ideal for the young artist in your family. Based on the works of master artist Larry Gluck, founder of Mission: Renaissance, these instructional DVDs use his groundbreaking method to teach your children how to paint in watercolor. Children create while following clear demonstrations which teach them how to produce beautiful watercolor paintings step-by-step. Watercolor basic lessons 7-12 expand a student's knowledge and skill of washes (the essential painting technique of watercolor), including learning how to do graduated washes. In addition, students complete their second and third paintings, a mountain scene and a sweeping desertscape. Watercolor basic lessons 13-16 show a student how to execute more advanced techniques and washes, including transitioning from one color to another seamlessly. Students will also learn the "wet-into-wet" technique, in which the artist begins a painting with a wet canvas to create a dreamy effect. Students then learn how to paint a watercolor sea horse and butterfly. Watercolor basic lessons 17-19 show students how to plan a watercolor painting step-by-step to create the best possible artwork with minimal correction. In addition, students learn how to create a still-life painting in watercolor, and how to duplicate an original Larry Gluck watercolor seascape. With all this information and new skills under their belts, students can create watercolor paintings to their heart's content! Prompt delivery, and all the dvds in good condition. Good service. �Before I started in Mission: Renaissance (Larry GLuck's Art School) seventh grade was tough. I was getting C�s in some of my classes. But then my parents signed me up for art classes for my birthday. Once I started I applied the rules in art to my learning and my grades. Suddenly my grades began to rise. Just after a few lessons at Mission: Renaissance, my grades changed from B�s and C�s to A�s and a few B�s.